Elsevier Hacks was an amazing bubble of creativity and ideas. I loved how it was a space to just focus on the task at hand, to have all these amazing, dynamic people that I had just met (teammates, fellow hackers and mentors) at arm’s reach. I also loved how there was an element of fun injected into the hackathon - with the quizzes, Lego challenge and the farm walk! 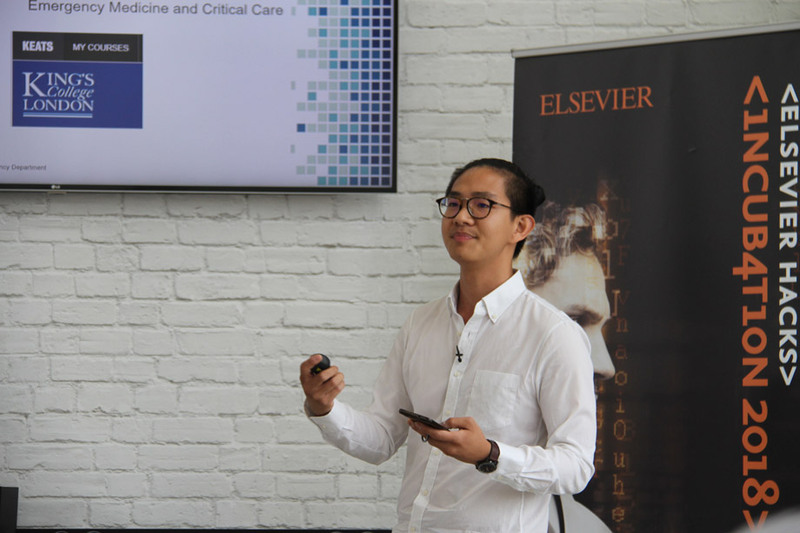 Foresight is a platform that gives evidence-based and data driven advice about how students can prepare for clinical rotations - tailored to each individual university and hospital. Students will be able to instantly access data about the most common medical conditions they will encounter, as well as hear from other students’ experiences of the rotation via the Foresight Community - which will help them focus their preparation for their upcoming rotation. Busy, stressed, anxious medical students in their clinical years - especially those at the point of starting a new rotation! The challenge here is - there’s so much we need to know, and the “classroom” (the patients and their medical conditions) is unpredictable. Foresight will help students focus their revision and to be prepared for the learning opportunities that await - in the unique setting of the hospital that they will be placed at. It’s been a real roller coaster - sometimes you’re up and making progress, sometimes things don’t go so well, and other commitments compete for my attention (more in the “what’s been the hardest” bit). Sometimes meetings with the team are amazing - I feel pumped with ideas, enthusiasm and optimism. Sometimes, even trying to find a time that works for all of us is frustrating enough! It’s given me a taster of what life might be like as a clinical entrepreneur. Like a roller coaster, it’s also goes very very quickly. I’ve really enjoyed exploring where this idea might go - and I’ve been able to bring it to my med school faculty, pitching it to them (after lectures, and at the free barbecue for the final years) and getting their input on it. Warning - honest content ahead! The entire incubation process has been more challenging than I could have anticipated. It’s not just a prolonged hackathon - it’s not just a matter of time, but also - of focus and attention. It’s been a real challenge fitting it alongside being a final year medical student, exams, research and other projects going on - not to mention my personal life! It’s also been difficult to work across time zones and over the Internet. Then there’s also the constant pressure (mostly self-imposed) and the incubation timetable to keep to - and the ever-present feeling of self-doubt, feeling lost, entrepreneur’s block (like writer’s block but for this). All in all - I have even more respect for entrepreneurs, especially those juggling both a clinical career and their startups! The entire startup world is a still very new to me - so every mentor session has been really insightful, opening up new possibilities of working. They’ve been extremely helpful with trying to solve our problems, and to provide advice when needed. A piece of advice that has really stuck was from David, quite early on - when he mentioned how some people try to “boil the ocean”, trying to solve too much all at once. It’s a piece of advice that I probably should have remembered a bit more throughout the whole process. Don’t boil the ocean. But if you really do want to, boil it one pot at a time, maybe? What I’m trying to say is - things will seem really daunting, but break it down and tackle little bits. Keep making progress. I’ve also learnt a lot about entrepreneurship in general, as well as leadership - particularly the weak points in myself! Lastly, why do you think Foresight will win the incubation prize? Again - honest content warning - we didn’t join with the intention to win the prize, we wanted to see where our idea could go, beyond 48 hours. But there’s a great reason that we should win - there’s still so much we can do, and it might just change the game for medical students, giving them Foresight, making the “unpredictable classroom” predictable.